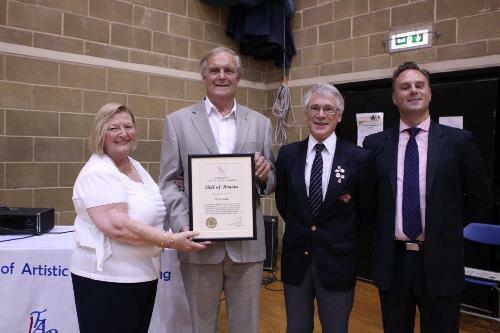 Peter joined the sport and became a member of the National Skating Association of Great Britain in 1953, and started taking various medal tests and spent many years in the Medway Roller Skating and Social Club. He has been involved in the sport since that time apart from a break when he was working with the ‘Tamara Moskvina Russian School of Ice Skating’ and a period working on the production of the film ‘Rollerball’. Later, with his partner Margaret they gave many exhibitions throughout Europe and the USA and performed in front of General Franco in Spain. They gave many technical demonstrations and instructional sessions of dance, including instructing Judges and skaters in the Italian Federation when they first started Dance skating. Peter also represented Artistic Roller Skating with the “Sports” spectrum, involving liaison with many Ice and Roller TV transmissions and productions in sporting event promotions. and produced a healthy potential supply of skaters from beginner to Championship level. He also worked on schemes to introduce Roller Dancing to both Italy and Portugal. Served on the Governing body of Artistic Roller Skating and served in all departmental committees of the NSA. The Trustees sincerely congratulate you on joining the Roll of Honour in 2013.